Second Scoop Frozen News: PreGel's New Products "Twist Traditional Up"
PreGel's New Products "Twist Traditional Up"
CONCORD, N.C., Dec. 13, 2011 /PRNewswire/ -- PreGel AMERICA, the U.S. subsidiary of the largest specialty dessert ingredient manufacturer in the world, today announced the anticipated arrival of three new frozen desserts and beverages: Cafettone™; Fruittone™; and Yogurttone™. Having caused a stir at industry shows and events across the U.S. for over a year, business owners will be delighted to learn how the frozen delicacies will provide a variety of options to diversify their business in a simple, efficient and cost-effective way. Utilizing the newest technology in the industry, the new frozen desserts and beverages are shelf-stable, instant ready-to-use powdered mixes that require only the addition of water or milk to produce Cafettone™, Fruittone™ and Yogurttone™. The sugar, flavor, stabilizers and emulsifiers are already blended into the mixes to ensure consistency while maintaining the highest quality standards in taste and texture. For business owners, profit margins are high with low overhead costs. The desserts are quickly and easily produced in an affordable tabletop machine similar to a slush machine, but with a stronger freezing compressor to chill the blends at or below -7 degrees C (20 degrees F) to create a product similar to soft serve in texture and gelato in flavor. The machine's freezing cycle is typically 45-60 minutes and includes a standby feature for the overnight storage of blends. Cafettone™ – A creamy concoction made with one of three Cafettone™ flavors [Mascarpone (Italian Cream Cheese), Fior di Latte (Sweetened Milk), Chocolate or Salted Caramel] and a shot of espresso or coffee. 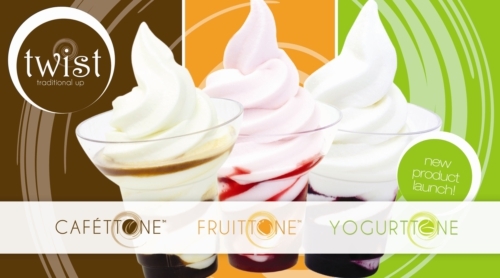 Fruittone™ – On the lighter side, Fruittone™ is a concept that offers the refreshing fruit flavors of Strawberry, Pink Grapefruit and Pear with a shot of berry or fruit juice for the ultimate frozen dessert drink. Yogurttone™ – Yogurt is big business today and PreGel's Yogurttone™ mix prepares a delightful tart frozen yogurt-style dessert and beverage perfect for any hour of the day. The idea is to swirl it with a fruit juice of choice for an added flavor boost, or layer with granola for a frozen parfait. The dessert and beverage concepts are trademarked and presented for PreGel customers to utilize as a selling tool to their consumers. PreGel offers an array of promotional support including Marketing Starter Kits featuring a point-of-purchase display, 2 sets of labels, 10 table-top point-of-sale displays and 5 floor decals. The concept will also include a website where consumers can obtain nutritional information. "The technology of the product and affordable machines will allow any purveyor of food products to include frozen desserts in their business model with ease and efficiency," said Marco Casol, CEO and president of PreGel AMERICA. "The reason this concept works so well for so many different businesses is the B2C positioning and concepts we have created. [Another] part of the program is that we provide all the tools needed to launch this concept including everything from serveware to store signage." The company is excited about this new endeavor and innovative product, and believes that it will change how Americans perceive frozen desserts and beverages. PreGel AMERICA's ultimate goal is to ensure owners' successful launch of the new dessert concept within their respective businesses by providing exclusive packages which include the single flavor machine, special variety packs of product and a Marketing Starter Kit. With this level of support, business owners can easily "Twist Traditional Up" while providing a unique frozen dessert and beverage option to new and existing customers. "Frozen desserts are not just for a nightcap anymore," said Jillian Hillard, Marketing Manager at PreGel AMERICA. "Cafettone™ is a great way to start your day. We want business owners and consumers to feel good about embracing frozen desserts any time of the day." For more information on Cafettone™, Fruittone™ and Yogurttone™, visit www.pregelamerica.com or call the company's toll-free number at 866-977-3435 to request additional information. PreGel AMERICA is the U.S. subsidiary of PreGel, a global ingredient company headquartered in Reggio Emilia, Italy. PreGel develops, manufactures and distributes natural ingredients, toppings and fillings of the highest quality from Italy, including flavors, powders and pastes used in gelato, frozen yogurt, pastry and other specialty desserts. Based in North Carolina since 2002, PreGel sells to restaurants, gelato cafes, coffee shops, frozen yogurt shops, bakeries, pizzerias, hotels, resorts, grocery stores and universities, as well as select distributors in the United States. PreGel believes in blending Your Passion with Our Ingredients. For more information, visit www.pregelamerica.com.